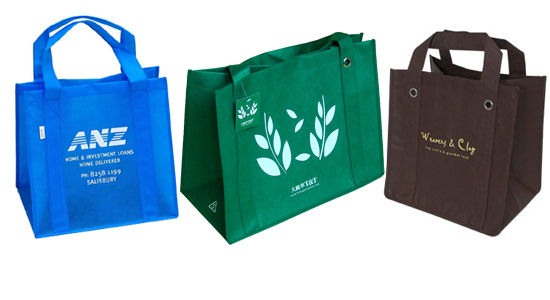 Non Woven Bags have become popular because they are reusable and eco friendly that made of 100% bio-degraded non woven polypropylene.Non Woven Bags are available in any size,color and shape. 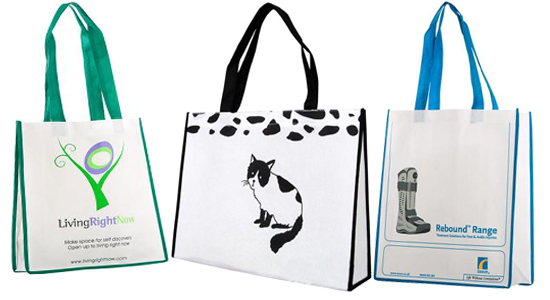 As one of the pioneer suppliers of eco-friendly bags worldwide, Gift Boxes Shop has been supplying non woven bags to retailers as well as corporate clients, large and small for more than ten years. Our close attention to customer service, as well as the manufacturing process, sets us apart from our competitors. All our products are of excellent quality, are competitively priced and are delivered with attention to a high service standard. Customer satisfaction is of utmost important to us. Gift Boxes Shop offer full range of non woven bags including custom made non woven bags and gift non woven bags to fit any occasion. There non woven bags Made from 100% recycled non woven polypropylene, these eco friendly shopping bags have the same look, feel, and durability as cloth bags. 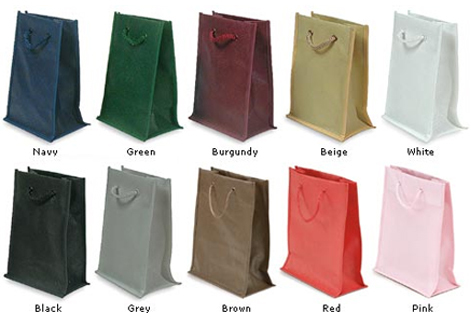 These non woven bags have loop handles,coming in 8 colors and 5 size to choose. size 1) 5 x 3 x 7" 2) 8 x 4 x 10" 3) 13 x 5 x 13"
4) 13 x 4 3/4 x 16 5) 16 x 6 x 12"
These Non Woven Bags are made from 100 g non woven polypropylene, these eco friendly shopping bags have the same look, feel, and durability as cloth bags. These non woven bags have matching cord handles, wide side and bottom gussets, and cardboard reinforcements top and bottom for extra sturdiness. We offer custom silk screen printing on all fabric tote bags. Hot stamp foil printing is also available . size:1) 5 1/4 x 3 1/2 x 13" 2) 4 3/4 x 3 x 6 3/4" 3) 6 x 3 1/2 x 6"
4） 8 x 4 x 10" 5) 13 x 4 3/4 x 16" 6) 16 x 6 x 12"
7) 16 x 6 x 19"
There Non Woven Bags are made from 100% recycled polypropylene, t These non woven bags have non woven loop handles, wide side and bottom gussets, and contrast trim. 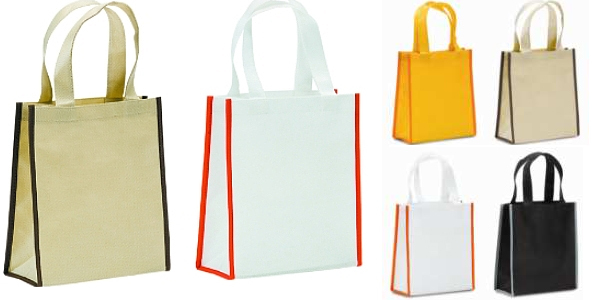 size 8 x4 x 10"
Non Woven bags are the most popular option for promotional use because their cost-effective factor and its vibrant colors & non toxic quality.Important non woven bags are so durability that can last long time,the printed business brand on non woven bags will be advertised long time. Business brands can be silk-screen printed,heat-transfer printed,PMS color or digitally printed in photo like results. 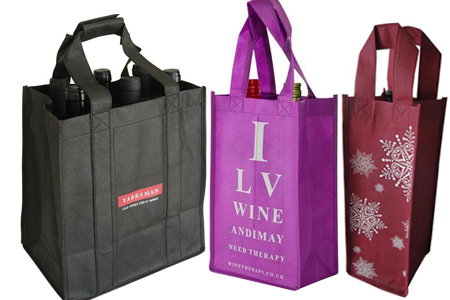 Non-woven PP is the perfect material for bottle carrying purposes.Durable and water resistant with reusable dividers and hard base insert, Non Woven Wine bottle bags are supplied in 100 gms thickness with handles stitched down to the base for extra carrying strength. Brand your very own reusable heavy shopper bag - features Hard PP base (stitched in if required), handles stitched to base for extra strength - suitable for an eco friendly grocery supermarket bag - anti bacterial free & water resistant. Customized to a general multi purpose eco bag that requires tough & long lasting reuse. Those shopping bags are available in any size and any shape. Gift Boxes Shop offer full range of non woven bags including shopping bags,promotional bags,wine bottle bags,foldable bags,drawstring bags that come in many size,color and shape to fit any occasion.Contact With us to get cheap non woven bags now.